Don't be so hard on yourself. I love the colored pencil. It is better than I can do. That is not much I have only done a few. 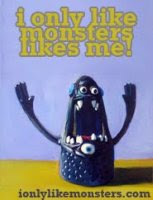 Guess I need to try black Gouache?I love your monsters. I wish I could knit.